London Paddington to Stroud 1 ½ – 2 hours direct or via Swindon to Stroud. From other directions via Cheltenham. 30/40 minutes walk to Hawkwood or 5 minutes by taxi, readily available at the station. Stroud has a limited National Express coach service from London‘s Victoria Coach Station, Heathrow Airport, Cirencester and from several other cities. From M5 motorway exit 13 take the A419 to Stroud (5 miles), follow signs to Gloucester & Cheltenham, turning off the A46 towards Wick Street onto Painswick Old Road. Hawkwood is about a mile on the right. From M4 motorway take either the A419 or A46. 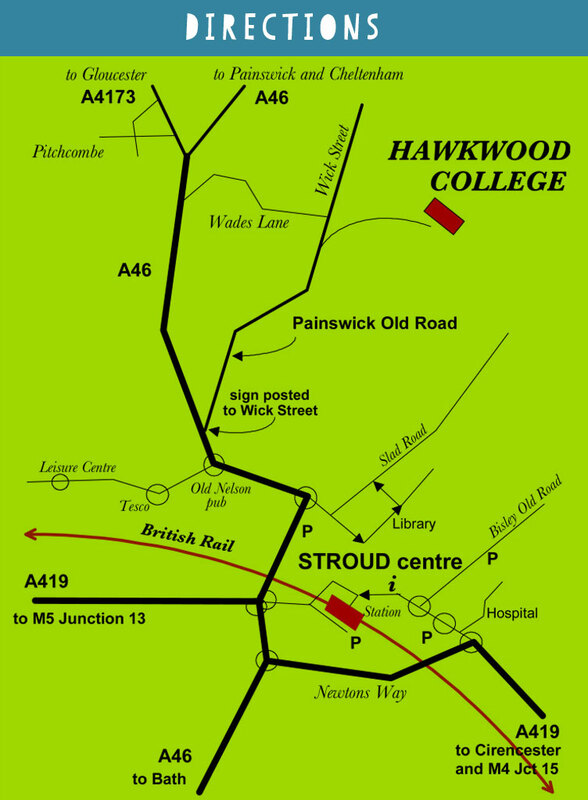 Follow the signs for Stroud town centre, then towards Gloucester & Cheltenham , turning off the A46 towards Wick Street onto Painswick Old Road. Hawkwood is about a mile on the right. Mainline train to Bristol Temple Meads (20 minute journey) change for Gloucester (45 mins) and then for Stroud (15 mins). Mainline train to Birmingham New Street (15 mins) change for Cheltenham Spa (45 mins) and then for Stroud (15 mins). Take AirLink coach to Reading railway station (45 minute journey with a coach every 20 minutes) and then mainline train to Stroud (65 minutes). Mainline train to London Victoria (30 minute journey with a train every 15 minutes), then the London Underground Circle Line west to Paddington (around 25 minutes). Then mainline train to Stroud (90 minutes). Final leg: 30/40 minutes walk to Hawkwood or 5 minutes by taxi, readily available at the station.